Photograph of Devonne Friesen, Executive Director of University Communications (2003-2005) ; a close-up portrait shot. Photograph of administrator Don Page chatting with two students outside the entrance to the Library. 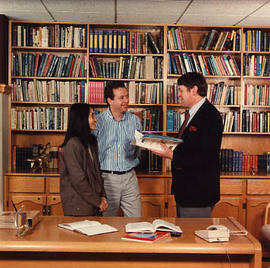 Photograph of administrator Don Page chatting with two students on the campus grounds. Photograph of administrator Guy Saffold standing in his office. Photograph of administrator Tom Bulick lighting a fire during the Student Leadership Retreat.